Looks like your go-to Peppermint Mocha is about to feel as “basic” as a Pumpkin Spice Latte. Starbucks has a surprising new drink flavor to help keep you feeling festive -- or, at the very least, pleasantly caffeinated – all winter long. Beginning Tuesday, the coffee purveyor is serving up a decidedly different holiday-themed drink like few have tasted before: the Juniper Latte. Inspired by last year’s Juniper Holiday Latte, served exclusively at the Starbucks Reserve Roastery in Seattle, the Juniper Latte will join a collection of holiday favorites that includes Peppermint Mocha, Caramel Brulee Latte, Chestnut Praline Latte, Gingerbread Latte, and Eggnog Latte. The new Juniper Latte combines Starbucks espresso, steamed milk, and new juniper-flavored syrup. Instead of whipped cream, it's topped off with layers of pine-citrus sugar dusted foam. Yes, pine. Like the tree. Don’t know what juniper is? (It’s an evergreen shrub or small tree). Sound delicious anyway? Well, if you’re a Starbucks Rewards member you’ll have a chance to enter to win a slew of prizes alongside the drink’s launch on Tuesday, including free drinks for life, BOGO beverages, and other prizes. To enter, start collecting game pieces on the official Starbucks for Life site during visits to Starbucks. Every play earns a game piece or an instant win, and most importantly, collecting three game pieces in a row gets you a prize such as the aforementioned free coffee. Starbucks said new "challenges" will be unlocked each week through the end of the year that will give you additional chances to earn more plays, so keep an eye out for those, too. In addition to the new drink, Starbucks is stocking store shelves with new holiday-inspired merchandise. The coffee company will debut a candy cane mug, glitter tumblers, and a new collaboration between Starbucks and ban.do. You can also get your hands on the Ember Travel Tumbler, a temperature-controlled mug that lets you customize how hot your drink remains while you drink it. The holiday cheer train doesn’t stop there. John Legend, the unofficial king of Christmas music (sorry, Michael Buble), will be taking over the Starbucks Christmas Party Playlist on Spotify. His musical reign begins Friday, November 30, so get ready to rock around the Christmas tree every time you find yourself at Starbucks throughout the Christmas season. 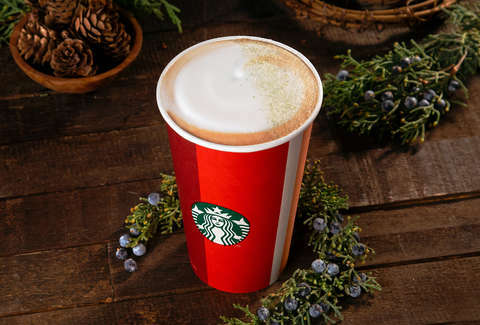 The Juniper Latte lands in Starbucks stores just in time to help propel coffee-reliant holiday fanatics through their seasonal shopping trips, late-night gift wrapping sessions, and commutes through the snow. So, on the bright side, you won’t have to settle for another Peppermint Mocha to get through all the simultaneous holiday stress and cheer.